Being worried about how your team’s playing is normal this time of year – but not helpful. Learn how to switch your thinking and start playing better softball! Free yourself up from this mistake-thinking by simply being 1 Run Better than Them! It’s really common for players and coaches to worry about mistakes. In fact, this is probably THE most common thing struggling teams worry about. This is the time of year when you’re grinding deep into conference play and every team is tough. That means your team will be challenged in some way, every single weekend, and not always up for the challenge. If your team is struggling right now, first know that it’s common – all teams are good now, and mistakes and losses are part of the game! But, constantly worrying about these mistakes is a very limiting way to think. Not only does it drain your overall energy, but it makes everybody on the team play a little tighter, which starts to make those same mistakes happen more often…not something you want! Luckily, there’s something you can do to help your team relax more and keep everyone from being nervous and tense all the time. Being relaxed doesn’t mean you aren’t trying or that you don’t care – you care a ton and you’re trying your guts out. It simply means that you aren’t stiff and tense and worried all the time. 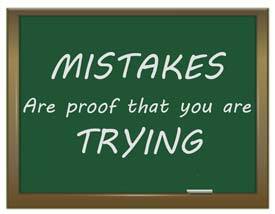 It’s important to know that every player or team that has won a championship has made mistakes! The best of the best make mistakes every game. Pitchers miss their targets, throws get thrown away, balls get bobbled, and players strike out. Errors happens every game, and it happens to the very best. Last year Oklahoma won the Women’s College World Series beating Florida in a best of 3 game series. You probably know that, but you might not remember that Oklahoma had 7 errors in the 5 games they played in OKC! 4 of them in one game – and yet they won that game and went on to win every game they played in the World Series, in spite of their mistakes. So, while they didn’t play picture-perfect, they did do one thing that’s VERY important – they scored at least 1 run more than their opponent in every game. It’s NOT about being perfect, it’s simply about being 1 Run Better Than Your Opponent! That’s all! You don’t have to play pretty, you don’t have to play flawlessly, you simply have to adjust from your mistakes and end up 1 Run Better than Your Opponents! Play Against the Clock: practice doing skills faster and stay focused on beating the clock, not beating perfection. Play Against your Teammates: practice doing a certain skill faster than your teammates, either individually or in pairs or teams. And keep going if you make a mistake, just do 1 more than whoever you’re playing against. Think in the Now, Get Out of the Past: instead of carrying around all the bad plays you or your team have made so far today, throw all of your thinking into the MAIN THING you must do to make THIS play good! Stay in the now and get out of the past! Support the Rebound: I’m not talking basketball rebounds. What I mean here is we all make mistakes so the next time one of your players or teammates bobbles a ball or blows it somehow, help them quickly rebound and get into the now! That’s why we play teams sports, so we can help others and let them help us! So be a rebounding coach or teammate, and let others help you rebound as well!